Belarus intends to position itself as a well-reputed destination for medical tourism at the Belarus-China forum in Shanghai on 7 November, reports the Belarusian Ministry of Foreign Affairs. Over the last decade, Belarusian private medical centres have won recognition in the post-Soviet space. According to one consultant, Marina Mastashova from the Sports and Tourism Ministry, medical tourism in Belarus will benefit further from the visa-free travel program. Uladzislau Androsau, the director of medical tourism operator MedTravelBelarus, told Radio Liberty that about 50,000 “medical tourists” visited Belarus in 2016. This number grew in 2017. Foreign clients frequently visit Belarusian private health-care centres due to the relatively low cost of medical treatment. Dental and cosmetic surgery remain the most popular procedures among foreign tourists, with facelifts and liposuction quickly catching up. Though officially medical care remains free in Belarus, private medical centres exist on a par with state hospitals. The Belarusian state allows the operation of private medical centres, yet makes them undergo rigorous certification procedures and sanitary controls. When Belarusians encounter long queues, ignorance and bad attitudes in state hospitals, some of them turn to private clinics instead. Belarusian private clinics offer paid medical services, yet generally provide a better quality and variety of treatments. Long queues seldom form, and doctors remain caring and polite. Belarusian private medical centres accordingly attract both Belarusians and foreign citizens looking for quality treatment and complex surgeries. While private medicine remains unaffordable for many Belarusians, many foreigners regard it as cheap. Consequently, a growing number of foreign tourists visit Belarus to obtain treatments excluded from the standard insurance policies. 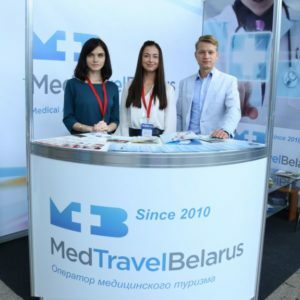 As a result, several big players have emerged on the Belarusian medical market, including such agencies as MedTravelBelarus, Wellness Travel, and Westglamur. The agencies like MedTravelBelarus conclude agreements with private clinics and health-care centres to treat foreign clients. They also provide visa support, lodging and other services for a comfortable stay. According to Uladzislau Androsau, many of his clients come from post-Soviet countries. Russians constitute the highest percentage among them. First, they choose Belarusian medical services due to the lower costs. More recently, with decreasing medical costs in Russia, many tourists continued visiting Belarusians medical centres due to their quality. Tourists from Ukraine and Kazakhstan make for another important group of clients. The ongoing problems in the Ukrainian and Kazakh healthcare systems, including corruption and poor pharmaceuticals, still bring a number of Ukrainians and Kazakhs to Belarusian doctors. Medical tourists from the Baltic states, Russian-speaking Israelis, and Belarusian expats also prefer Belarusian medical services due to their affordability. Belarusian expats have already obtained the nickname “tooth tourists” as dental surgery remains the most popular medical service they return home for. Nevertheless, despite the increasing potential of the Belarusian private medical industry, it remains pretty unknown to audiences outside the post-Soviet region. Clients from other corners of the planet, including Western Europe, visit Belarusian private hospitals much more rarely. As Androsau tells Radio Liberty, it still takes considerable marketing efforts to promote Belarus as a global healthcare hub. At the same time, certain preconditions have already emerged for the world-wide recognition of Belarusian private medicine. Many Belarusian medical staff speak fluent English. 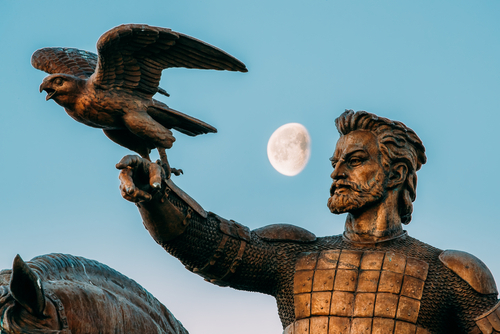 Apart from that, Belarus’s proximity to both European capitals and Russia’s major cities, combined with cheap lodging, also raises the country’s attractiveness as a potential healthcare hub. Belarusian private medical centres offer cheap costs in comparison with the European Union and the majority of post-Soviet states. For instance, while breast-enlargement costs about $3,000 in Belarus, the same procedure costs approximately $5,000 in Lithuania and $7,000 in the UK. While a Belarusian medical centre charges about $2,000 to remove fat with excess skin from the abdomen, a Lithuanian centre charges around $4,000, and a British centre – around $9,000. The price differences become even starker for dental surgery. 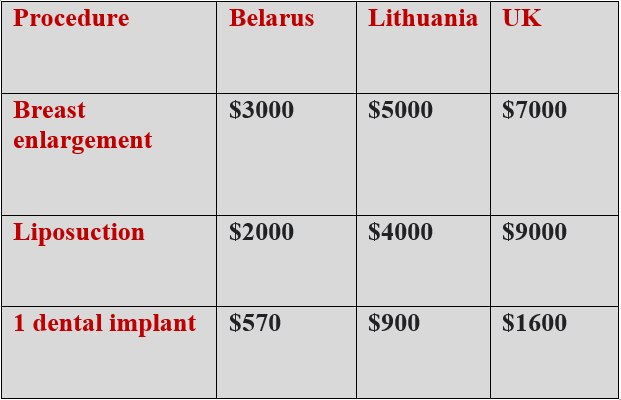 For instance, a new dental implant costs about $550 in Belarus, and the same implant costs about $2,500 in the United States. While a Belarusian dental centre charges about €500 for one particular Swiss dental implant, a Polish dental centre charges no less than €800. In the UK the price reaches €1,400. Similar price differences remain in cardiology and ophthalmology. The most popular private medical services offer dental and cosmetic surgery, mostly tooth and breast implants, as most of the standard insurance policies fail to cover them. Facelifts, liposuctions, and hip and knee replacements also remain in demand among foreign clients. 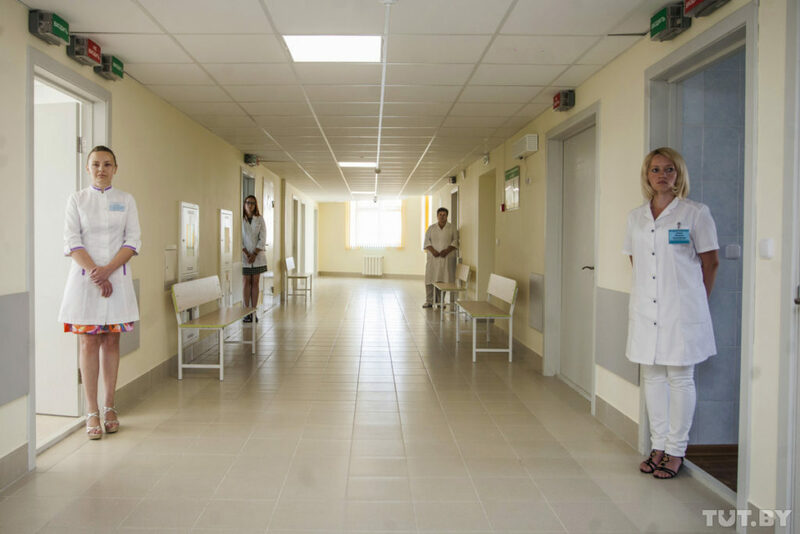 In addition, Belarusian private medical centres offer different services in the fields of cardiology, gynaecology, oncology, ophthalmology, traumatology, neurosurgery and rehabilitation. Comparative costs of popular surgeries. As the Belarusian medical tourism industry grows, the state has also joined the marketing efforts to promote Belarus as a global healthcare hub. For instance, the Belarusian Ministry of Health has recently held talks with China’s National Health Commission to initiate the program to treat Chinese children in Belarus. The first group of children arrived for rehabilitation procedures in September. At the same time, the flourishing of Belarusian private medicine clearly signals problems in state medicine. For many Belarusian doctors getting a job in a private clinic remains the most desirable career path. The salaries in private medicine substantially exceed those in state medical practices. According to Sputnik and Radio Liberty, a state doctor’s average salary reaches close to $500 per month, yet an inexperienced doctor might receive a very modest $250. On the other hand, salaries in private clinics start at $800 – 1,000. Poor salaries keep nurses and doctors unsatisfied with the job and drive many of them to Belarusian private clinics or even abroad. The quality services of private clinics, such as dental surgery, remain unaffordable to many Belarusians, including pensioners. Hence, they have to rely on state clinics with their long queues, stressed doctors and the lack of quality pharmaceuticals. In this way, the Belarusian medicine illustrates the growing trend of social inequality: brilliant medical services for the rich and below-average services to the poor. On 28 January, Vilnius hosted a performance of the Belarusian ballet Vitaut (Vytautas in Lithuanian). The performance has courted controversy, with the Lithuanian culture minister describing it as a provocation six months ago. The ballet shows how joint heritage, instead of uniting the two countries, actually divides them and puts Lithuania on the horns of a dilemma. On the one hand, it would like Belarus to transform into a Western democracy. But on the other hand, it recognizes that the Western identity of Belarus challenges Lithuania’s own identity since it requires both countries to draw on the same historical heritage. Western historiography mainly looks at the history of the Grand Duchy of Lithuania (GDL) similarly to how Alexander Lukashenka did a couple of decades ago. For many Westerners, in line with this interpretation, the Grand Duchy is a Baltic country. However, in reality, it was an alliance of Balts and Slavs, where the Slavs and their language dominated. For example, Lithuanian Statutes were written in Ruthenian; the language Belarusians often depict as the old Belarusian language. With the passing years the history of the Grand Duchy becomes less exclusively linked to today’s Lithuania, either in the West or in Belarus. In 2012, Norman Davies, possibly the most well-known researcher of Eastern European history, published his book Vanished Kingdoms, where the chapter on the Grand Duchy of Lithuania opens with a photo of Lukashenka. Recently, Belarus’s authoritarian leader has showed increasing enthusiasm about the Grand Duchy. In 2017, while discussing school textbooks, he argued that “Belarus needs to introduce into the minds of our people the truth: that Belarus started its history from the states of Polatsk and the GDL.” On 20 January, the commander of the Belarusian interior troops said that even the army now studies the history of the Grand Duchy of Lithuania. Many Belarusians enjoy joking that Vilnius belongs to them (as, too, do Poles). It’s no wonder that few Lithuanians find such jokes funny. They feel that Belarus is like a brother about whom no one knew, but he appeared at the moment a deceased grandmother’s estate was being shared out. Moreover, now the brother comes to Vilnius and starts to teach you the family history. Lithuanian media occasionally write that “Lukashenka has set his sights on the pride of Lithuania” or “The day when Belarusians will say ‘Vilnius is ours’ is coming.” Quite naturally, these ‘clickbait’ headlines bring traffic to websites, but damage mutual understanding between the two peoples, which has implications for policy-making. For instance, the Lithuanian authorities seem to fear excessive collaboration with Belarus-centric organisations. The European Humanities University, a Belarusian institute exiled to Vilnius, serves as the most famous example. It receives assistance from a number of international donors, including Lithuania, and almost everyone in the Belarusian civil society remains dissatisfied with the work of the EHU. In 2014, 40 Belarusian intellectuals, including Nobel prize winner Sviatlana Alieksijevich, wrote an open letter in support of preserving the EHU’s Belarusian heart. The EHU spends at least $150,000 on the annual salary of the rector, despite its provision of a low-quality education. In December 2017, Lithuania’s Centre for Quality Assessment in Higher Education negatively evaluated the EHU and the Lithuanian Ministry of Education will deprive it of its licence by the end of 2018. But the Lithuanian authorities continue to support Professor Anatol Michajlaū, former rector and current president of the EHU. Insiders attribute this to Michajlaū’s promotion of a non-Belarus-centric vision of Belarus, which Lithuanians do not perceive as competition. Disputes around historical heritage also intensify other conflicts, especially the controversy surrounding the Belarusian nuclear power plant. The station, which Belarus began building 55 km from Vilnius in 2013, has become a major stumbling block in bilateral relations, since Lithuania sees it as dangerous for its own security. According to a Belarusian public activist, “If the Lithuanians feel that you do not share their opinion about the Belarusian nuclear power plant, then you are a Russian agent.” Two-thirds of Lithuanians perceived Astraviec power plant as a threat, according to Lithuanian polling agency RAIT. According to another pollster, Spinter, only 6.5% of Lithuanians considered Belarus a friendly country in 2014. On the one hand, Lithuania feels it should strengthen Belarusian identity in order to acquire a friendly European neighbour. Promoting common heroes such as Vitaut undoubtedly helps to that end. On the other hand, the strengthening of the Belarusian identity may lead to sharing the history that Lithuania long considered exclusively its. Things became more complicated as both nations are small and long for a strong simple identity. A dialogue on the two states’ common history might help to build a shared vision of the GDL, but conflicts and misunderstandings such as the one over the nuclear power plant, sow distrust. Previously such dialogue took place during the International Congress of Belarusian Studies that was held annually in Kaunas, Lithuania. However, in 2017 the Congress moved to Warsaw and this year it will take place in Minsk. So, currently it remains impossible to speak about any kind of joint textbook or other historical projects. Rather, the countries will develop with their own internal inertias. Belarus will rediscover its history, while Lithuania will feel that its history is being stolen. It remains unlikely that it will bring any positive fruits for cooperation between the countries.